CASE STUDY– “Treana” is a beautiful 36 foot Lindell Sport Fisher, built in 2000 by the Jim Lindell Company. She has twin 350 HP Yanmar Turbo Diesels and cruises at 18 knots, with a maximum speed of 26 knots. Dry weight is 22,500 lbs. The owners are long range cruisers and can spend weeks at sea without shore power. Treana has a 5kw Genset, but power requirements could not keep the battery bank charged. Batteries were 8D lead/acid. Accessories drawing power include an Espar heater, Fridge, Coffee Maker, Hot water, Freezer, Dingy Davit and a variety of Electronics. 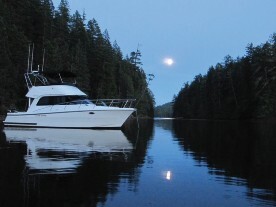 Treana’s owners called on Jeff Cote at Pacific Yacht Systems in Richmond, BC for a solution. His recommendation; replace the aging lead acid batteries with new Firefly carbon foam batteries, install a pair of Analytic Systems IBI2-40-200 Ideal Battery Isolators, one on each engine behind the 90 amp alternators and add an Analytic Systems BCA1505V-12 100 amp Battery Charger was added to provide quick bulk charging of the battery banks from either the genset or shore power. 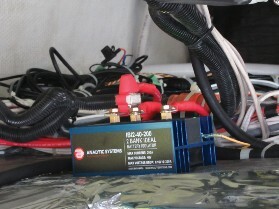 The extremely low voltage drop across the Ideal Battery Isolators (0.07 Volts at 90 Amps) allowed the alternators to fully charge the batteries to their specified voltage. The older style Diode based isolators used previously lost nearly a volt, preventing the batteries from ever being fully charged by the alternators. The military grade BCA1505V charger is easily adjusted to accurately charge the batteries to the proper voltage, with compensation for battery temperature. The extremely low noise and ripple on the charging output ensures that the lifespan of the batteries will not be diminished by 60hz ripple present on many lower cost chargers. In addition, the charger produces very low emissions so there is no negative impact on radio communications or GPS navigation. 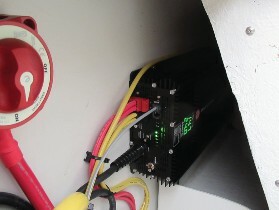 The bright LED display that can be read from across the engine room shows the charging voltage and current. Treana’s owners are very happy with the new hardware and report that all the issues that were being experienced before the upgrade have been completely resolved.